New York Times and USA TODAY bestselling author Sherryl Woods draws you into the world of Rose Cottage, where the D'Angelo sisters reunite with family and find lasting love. The Laws of Attraction High-powered attorney Ashley D'Angelo has finally burned out. After heeding the call of Rose Cottage, she believes she may have found the calm she so desperately needs and perhaps the chance at a happy ending with handsome Josh Madison. But if Josh isn't quite who he seems, is he still the man who can complete Ashley's joy? 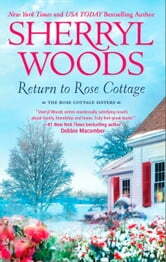 For the Love of Pete After hearing her sisters speak of the emotional healing to be found at Rose Cottage, Jo D'Angelo takes a chance and returns to the beautiful home. Only she knows the cottage is where she once loved and lost Pete Catlett. She's stunned to find Pete back there, as well, dealing with worries about his young son. Can the romantic wonder of the cottage reunite these two wounded souls?